The new Adobe Illustrator CC interface is much more tablet and touch friendly. In this screenshot, Windows 8 interface scaling is set to the default 150%. 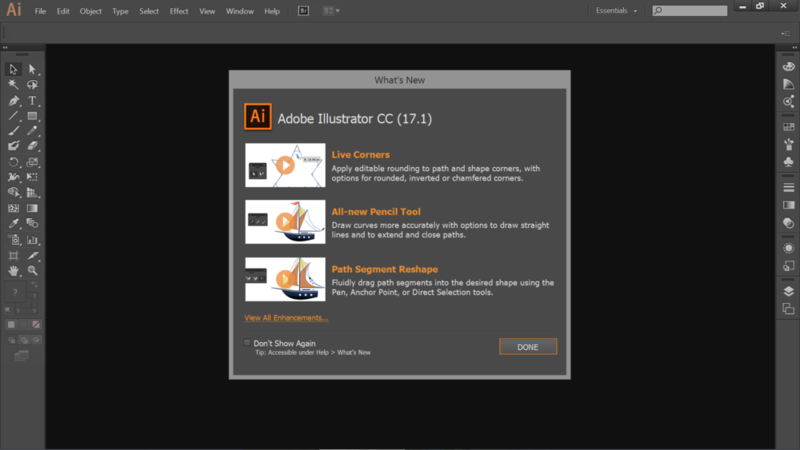 Adobe yesterday released version 17.1 of Adobe Illustrator CC and it's a big deal for Surface Pro and Windows 8 tablet users. The software no longer requires legacy Wintab drivers to be installed to recognize pen pressure. And it can also recognize multitouch gestures for panning and zooming. In my brief testing, touch response isn't as fluid as on software like Manga Studio or Clip Studio Paint. Zoom is particularly jumpy. I couldn't get it to recognize canvas rotation. Additionally, Illustrator CC now supports Windows 7 and 8 HiDPI displays, so you can say goodbye to microscopic menu text and icons. Curiously, Adobe also released Photoshop CC 14.2 yesterday, but it does not include either pen pressure or HiDPI support. You'll still need to install the Wacom feel IT drivers and our previously published DPI hack. Thanks to reader Luis Camacho for the heads up! In this screenshot, Windows 8 scale is set to 100% (small).